A selection of acoustic ditties. dope on a rope - listen here! i won't want you - listen here! 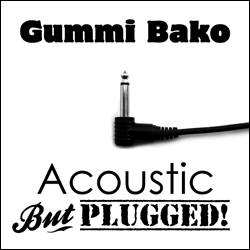 The debut split single from Gummi Bako and Come In Tokyo. Released by Nekkid Rekkids on 7" vinyl. i'm depressed - listen here! A selection of homegrown mellodaze recorded on 4-track tape. Handily available on CDr. A compilation of songs recorded for samplers, radio shows and christmas specials (see below). Lovingly compiled onto CDr.